Complete ERP Solution for Dealerships and Trading Organizations, having AMC, Workshops and Call Centers. May it be for gensets, May it be for Tooling, May it be for Machines, May it be for Compressors - What are the most important functions in a dealership management? SERVICE and CALL TRACKING- Both are managed in a very professional way in a dealer management system. The major source of revenue – Workshop and Inventory are tracked precisely on a centralized database in the Dealer Management System. 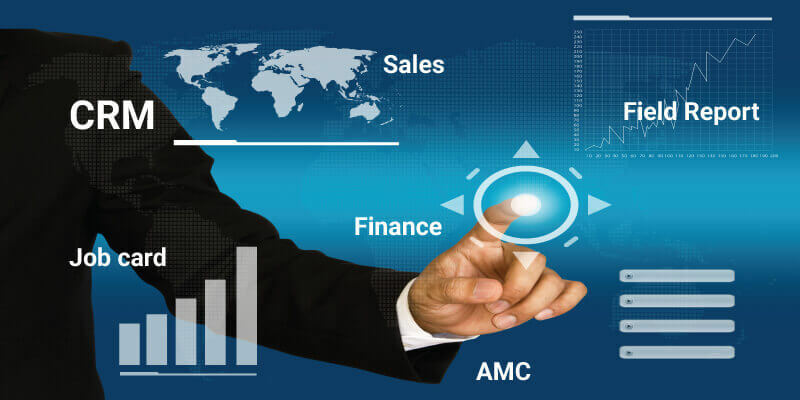 1) A very high volume of transactions with precise accuracy, releasing the P&L ratio to manage the complicated and fast changeover of decisions, keeping the dealership’s service levels polished, all at the same time to efficiently increase and manage revenue is what the Dealer Management System delivers. The dealer management module has provisions to register customer enquiries and sales department can generate part wise detailed quotation. Before sending material to client, the system provides Proforma Invoice Indicating Prices and stock availability as per order placed. A searchable database of marketing material, primarily pdf’s, images and zip files that allow End Users to access/download the marketing material. Each item uploaded will allow the "year", "Make" and "Model" fields to be added and used for searching in the dealer management system. For images and pdf's, need to have a thumbnail view so people can see this before they click to download some high resolution files. Admin Panel for control of uploading and downloading of images and content to be changed or updated in the dealer management system. Material Requisition, Purchase Order, Supplier Analysis, Goods Receipt Report, Labor Billing, GRR and GRN are separately tracked for RMA and valuation. Material received is in warded in to stock against quantities checks like short receipt, damage parts and 2-3 more parameters. A typical dealer management system will manage to purchase different from the traditional systems taking into consideration the spread and the scope of the material and its involved movement. Material Receipt, Material Issue, Goods Return, Stock Ledger, Stock Analysis, Slow Moving stock, Dead Stock Analysis & Relevant Reports. Complete Inventory management, including DMSR, WIP, Third party stock monitoring, Stock Valuation and Inventory turnover ratio management. Order Booking on Principal is registered as order acceptance. This is either calculating by Net weight or average weight method in a typical dealer management environment. Materials forwarded to third party (TP‘s also cover the Sister DBU’s – Divisional Business Units) are monitored to track the probable job completion. Basic system to generate automated SMS, e-mailers for change management, reporting of non function execution via hierarchical SMS and mailers. Claim Registration – This will be an online application that can be accessed by the end user as well as the back office of the dealer. DMS Integration – Document Management System will be integrated with the dealer management application for uploading as well as searching the relative documents for claim raising and processing. History – This will maintain the history of that particular VIN, its claims for that particular dealership, past records in the dealership. Alert Management - Email and SMS integration for a feedback for the claims received and under process for the client and alerts for the Claims officer in the dealership that the claim has been reached. Authorization and Claim Processing – Inspection of failed parts, Vehicle Status (In Warranty/Out of Warranty), Authorization, Replacement Ordering, Stock Checking, Regular to Warranty Transfer and Replacement of parts in relation to VIN/Model/Client, etc. Back Order – Auto Generation of PRN (Requisition) according to relative Stock level present, Claim processing at Back Office and order placement on the OEM and status in relation with the Purchase from OEM. Feedback— Client feedback for warranty processing. CMS and Library – Content Management System for uploading of pictures of vehicles, new arrivals, spare parts, News, Catalogues, Technical releases, Specification sheets, Marketing kits etc. E-Commerce Integration – Integration with third party CRM for payment gateways. Accounts and Finance Integration – Excel Output for all transactionas date as well as sale purchase –RMA (Return Material Authorization) vouchers. User Logs – Tracking of IP’s and User names for user activity on the application. Error Logs -- Tracking of Errors for user activity on application. System Control – 8 Level access control system for access – Create, View, Modify, Lock,Upload, Download, Approvals, Super admin. User friendly -- Easy to operate. Principle of only once entry -- Reduce Time and Labor. Used by many Industries -- Diverse Applications. Quick Sales and Support response -- Dedicated Service Teams. Most competitively priced -- Genuine cost advantage. All important reports at a glance -- Fast Decisions. End to End implementation gives you a totally Paperless System across the organization.